Size: 3 3/8"L X 1 1/2"W X 5 1/2"H.
Material:High boron silicon heat resistant glass. 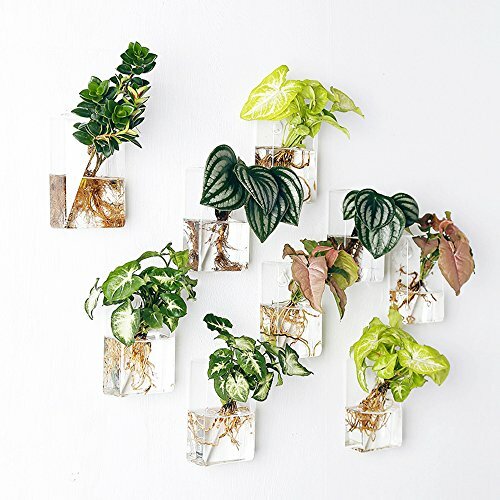 Size: Approximate Dimensions 3 3/8" X 1 1/2W" X 5 1/2"H.
The feature is a rectangular clear, sturdy glass with a circular hole in front of the container, allowing you to add plants, white rocks, pebbles, acrylic, and other decorative items with ease. Great Decoration idea for home, garden, Wedding or holidays. It helps beautify and purify your house or office, a good decoration for you.Mkono is a registered trademark and our product is professional manufacturing and sole selling. Gardman R258 Faux Natural Brown Rattan Wall Basket, 11" x 7.7" x 8"